Sulphur Springs, in Tennessee's Washington County, is one of the more country and quieter areas to live in, placed just 30 minutes south of Johnson City. Sulphur Springs is a community known for its history of German, Scottish, and Irish settlers responsible for the implementation of churches, a school, and a post office back in the 1800s. To this day, Sulphur Springs is recognized for its nearly 200-year-old annual Sulphur Springs Camp Meeting, where people from around the across the country come to celebrate the United Methodist Church in the Southern Appalachian region. This small community is the perfect combination of lush trees and quaint rural surroundings, with Clear Fork Creek meandering through the hamlet. Sulphur Springs real estate is mainly made up of homes that are located on acreages dedicated to farming and raising cattle. Sulphur Springs is a pleasant, rural community for anyone wishing to live on a farm or in a house that is removed from the busier parts of Washington County. Though this area is predominantly countryside, you'll find that Sulphur Springs is well-connected to Highway 81 and 26. Jonesborough and Fall Branch are just 20 minutes away. Not every house in this area operates as a farm. Some home buyers will find ranches rested upon smaller acreages built for recreation, smaller-scaled gardens or hobby farms. These types of ranches are typically Colonial styles with red-bricks, exposed white beams, and cozy porches, all of which make for a charming entrance. Some are quaint countryside bungalows located on a generous amount of greenspace. Many Sulphur Springs homes for sale have basements, septic tanks and run on city water. Some lucky home owners have mountain views and access to the local streams from Clear Fork Creek. Privacy is created by the lush trees and rolling hills native to this area. Interested homebuyers will find properties ranging from 2- 50-acres. Acreages can be developed for recreational use or for businesses. Farms in this rural community usually come with private ponds and access to long-standing barns, which are ready for production. In fact, much of the agriculture is grown for cattle, including corn crops. The incredibly arable soil in this area is ideal for cash crops. If you are hoping for a smaller property to maintain, Sulphur Springs offers duplexes and condos that reach a little over 1200 square feet. These types of properties have open floor plans accommodating up to 2-3 bedrooms and bathrooms. Home owners of these units even have their own garages and parking space. Life in Sulphur Springs is the epitome of countryside living in this part of northern Tennessee. Residents in this region are removed from the busy city life, yet not too far away from engaging activities and recreation. Being close to Jonesborough, you’ll have all the big box stores to choose from, as well as local-independent businesses to support. Bays Mountain Park and Planetarium, one Tennessee's largest city-owned park in the state, boasts a 3,550-acre nature preserve. Visitors enjoy a large lake, a Nature Center with a state-of-the-art Planetarium Theater, and an Adventure Ropes Course. Kids will love zip-lining, and the miles of trails offered for hiking, running, and sight-seeing exploration. This is a fabulous attraction for all ages, and it's less than a 30-minute drive away from home. Tri-Cities airport is conveniently located 20-minutes away from home and easily accessed from the I-81. Some people in this region do business in neighboring cities and states, so flying is a convenient option for those living in the countryside, or for anyone who would like to fight traffic! Cherokee National Forest is located just 45 minutes south of Johnson City. It's one of the best destinations for recreation and outdoor activity in the US. With over 2,500 kilometers of protected land, visitors have plenty of opportunities to enjoy the great outdoors. Biking, whitewater rafting, hiking, camping, hunting, and beautiful scenic drives are just some of the activities offered in this stunning land preserve. Being close to the northeastern Tennessee nature is what life in Sulphur Springs is all about. 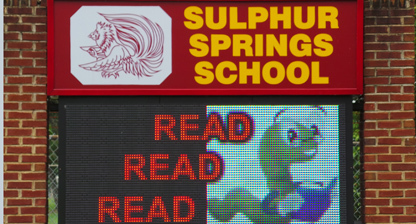 Think you're ready to take a tour of Sulphur Springs and the homes for sale there? When you are, contact the Byrd Home Team to help you find your dream Tennessee home.